Sometimes I see really awesome stuff when I’m out and about, only to not be able to find a solid online or major Canadian retailer with which to direct readers to. Today’s suggestion was ALMOST a case of that, as I spotted the item in a locally-owned chain of home stores, but I managed to track down the manufacturer. Alternatively you can sashay into your local gift stuff and ask them to bring them in, as they’re pretty nifty. Anyway, first some shop talk. Last year was the first year the boyfriend and I actually did Christmas stockings for one another. Despite living together for the year before that, my parents had done one last stocking for me. It was funny because just like with my parents, my stocking had about half of what his did (just like my mom’s – which is created mostly by my dad – had half of what my dad’s does). Not that I’m complaining…he bought some very practical and expensive essentials (like my razor blades for the year) and a few sweet things as well. The real trick to Christmas stockings however, is stockpiling, which is more or less what I did last year starting around this time. If you’re a real keener you’ll start squirreling away stuff year-round, but realistically October is a good time to at least let some ideas percolate in terms of holiday gift giving. Additionally, mid-October is typically when the retailers start rolling out all manner of Christmas goodies, including fun gift sets of food items or cosmetics, meaning you can at least scope out some cool stuff. 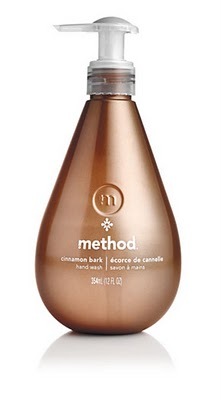 Case in point – last year Method hand soap rolled out a three-fragrance line of hand soaps in holiday-themed scents like Cranberry, Cinnamon Bark, and Vanilla Mint (incidentally I spotted them on the shelves again a mere week ago). My mom is a big proponent of Method products, so I snapped up a bottle for her and passed it onto my dad to stuff her stocking with. Simple! I’ll go more in-depth on stocking stuffer magic as the weeks roll on, but lesson 1 is, quite simply: accumulate early. My suggestion for a stocking stuffer today promises to make one of the best parts of most people’s days that much better. That’s right, I’m talking about shower time. Hydra is a California-based company that is best known for their Shower Steamers. Basically you pick a fragrance of your choosing – many of which use aromatherapy’s natural benefits to help you overcome stress, get perked up in the AM, unwind after a long day, or tackle a nasty hangover. 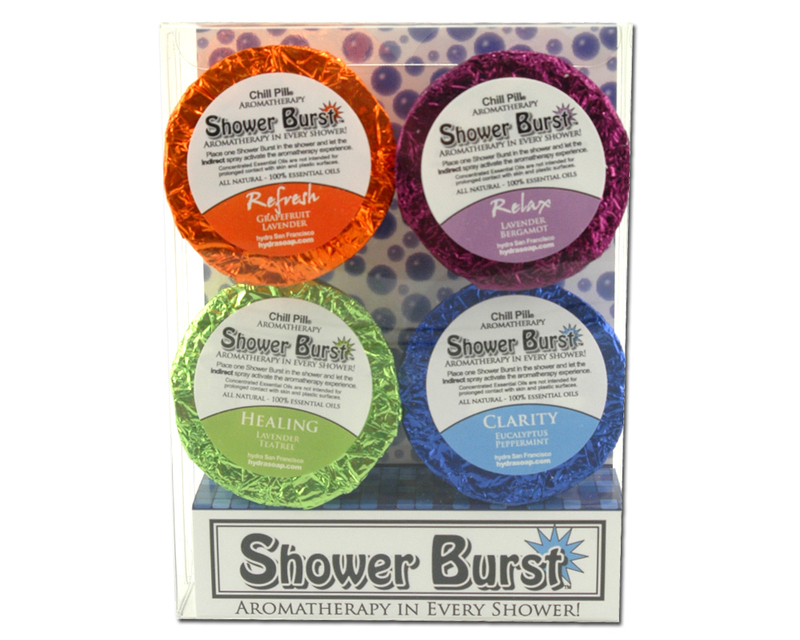 You throw the puck in your shower and the steam naturally releases a powerful, soothing scent to make your shower and bathroom an olfactory oasis. The steamers I saw (along with the brand’s line of ‘bath teas’ and bath bomb ‘chill pills’) were priced at just $5, making them a perfect stocking stuffer or something nice to throw into a spa gift set you’re putting together for a stressed out pal. They also offer seasonal gift sets and starter kits if you want to go all out, or split them up among friends. I like the idea of these as a unique standalone item, instead of immediately knowing where it came from as you would when buying from a chain body store. I also like that they use natural ingredients and aromatherapy instead of just making something that smells nice. 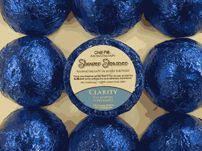 Plus, the fact they’ve created a bath bomb-esque product for the shower – which let’s face it, is what most people take 95% of the time – is super handy, meaning you won’t be stockpiling buckets of soaps under the sink. As for where you can buy them? Well, try calling around to a few local gift shops first and ask if they carry any bath products made by Hydra, specifically the shower steamers. If you’re out of luck there, you can actually order from the (unremarkable) Hydra website, who promises to find the lowest shipping options for their domestic or international (that’d be us Canucks) clientele. Either way, sweet showers are just a tablet away!